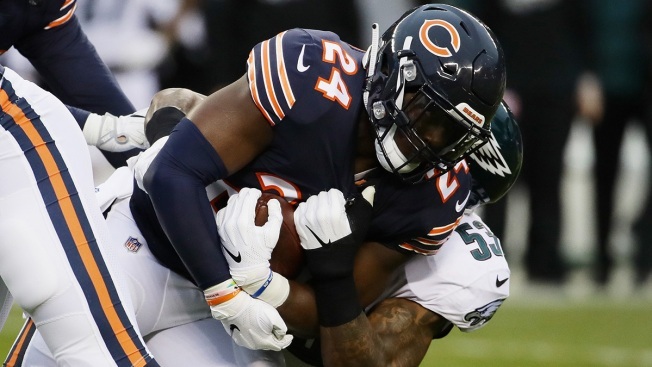 The fate of Jordan Howard has been on the minds of Chicago Bears fans throughout the offseason, but there is at least one prominent football scribe who thinks there’s a chance he could be suiting up in a different uniform next season. In an interview with the Mully and Haugh Show on Wednesday morning, Chicago Tribune football reporter Brad Biggs said that he expects the running back to either be released or traded before the team opens the season against Green Bay in September. The running back failed to rush for at least 1,000 yards for the first time in his NFL career, and he also set a low mark for receptions as well, as he only hauled in 20 passes in 16 games. He did have nine rushing touchdowns on the year, but with questions about his fit in head coach Matt Nagy’s system, Howard could be the odd man out when the Bears break camp in Bourbonnais later this year. If the Bears were to release Howard outright, the salary cap implications would be negligible, as he would only count for roughly $60,000 in dead cap money for the coming season. During NFL meetings in Phoenix this week, Nagy did say that he can see Howard fitting into the offense despite his struggles with catching passes.